Roosevelt is Jewish. Rosenfeld was the first name and he wasn’t regarded as one of the first founders of Jewry in this country, either. I have a book out there with the pedigree of all the Jews in it written by a Jew which I can show you ...some of them more famous Jews than he. Since the election of Franklin D. Roosevelt in 1932 this country has been educated to a new phase in government … Or shall we say that which it is? It is assuredly “Freedom and planning” adapted to the United States … Stripped of all its commouflage, it is a guild form of government … The guild form of government is directly the opposite of the constitutional form of government, It is the Jewish plan of a world estate. 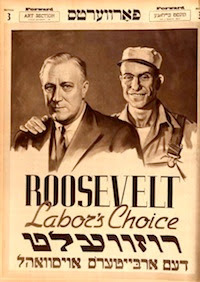 President Roosevelt intends to repeat the “Pax Judaica” of Woodrow Wilson who led the United States into the World War because he acted on behalf of Morgenthau, Warburg, Jacob Schiff, Louis Brandeis, Kuhn, Loeb & Co., all Jewish bankers of New York and masters of the world. President Wilson was able to put across his cheme because 20 percent of America’s population was Jewish then, but it is easier now, because the number of Jews number 40 percent of the total population today and because Roosevelt himself is a Jew. All I know about the origins of the Roosevelt family in this country is that all branches bearing the name are apparently descended from Claes Martenseene Van Roosevelt, who came from Holland sometime before 1648. In the dim distant past they may have been Jews or Catholics or Protestants - what I am more interested in is whether they were good citizens and believers in God - I hope they were both. Things changing and staying the same? Well, at least no one was questioning whether he was born here.